The One Hit Wonder strategy is as simple as it is useful. You stake on (single) numbers, each time the wheel spins. Even though this system is often overlooked by roulette players, it is often a more succesful strategy than more intricate betting strategies. How does the One Hit Wonder betting strategy work? You pick a lucky number. You can choose to stick to this number or change your lucky number, for each spin. SPLIT: A pair ( or doubles), two numbers next to each other. Examples of doubles are 1 and 2, 1 and 4, 7 and 8. STREET: Trebles, three numbers on one line. Examples of trebles: 1/2/3, 10/11/12. CORNER: Foursomes, four numbers connected by one corner. SIX LINE: Two lines of three numbers each that lie next to each other, 6 numbers in total. DOZEN or COLUMN: a set of 12 numbers, either a column or a dozen. Examples: Dozen: ‘1st 12’, ‘3rd 12’. Column: 1/4/7/10/13/16/19/22/25/28/31/34. Examples: Black, 19 to 36, Even. 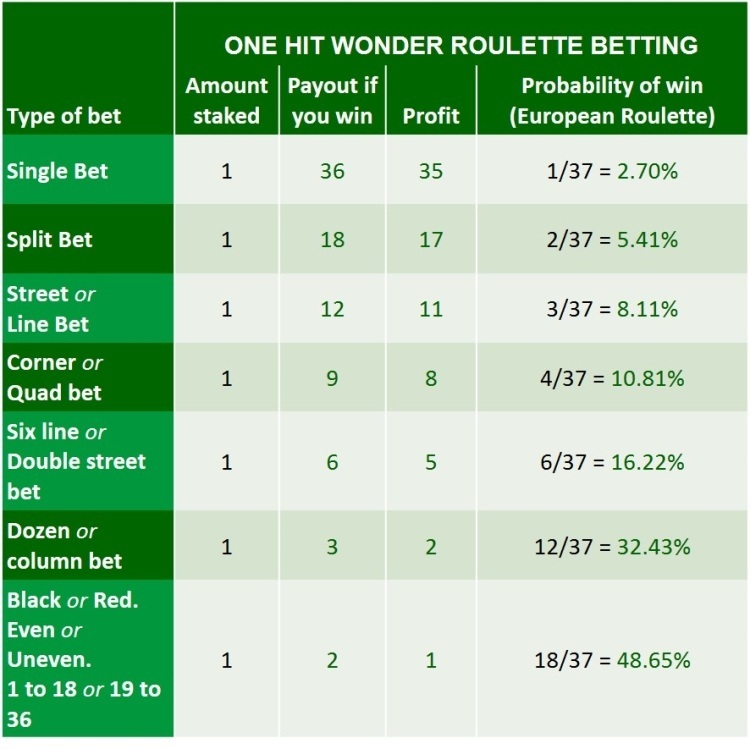 The table below summarises the different stakes available in the One Hit Wonder Roulette system. How succesful is the One Hit Wonder strategy? You might think that the One Hit Wonder strategy is almost too simple to work. The trick is that when you stake on 1 single, 1 split, 1 street, 1 corner or 1 six line, that you are not staking a lot for the whole Roulette session (of 100 spins). As your stakes are small, you are not exposing too much risk to the casino. The casino hold decreases. The result is that the One Hit Wonder strategy is more attractive and much smarter than most of the progressive even bet roulette strategies, such as the Martingale strategy or the D’Alembert strategy. Yes, we were just as surprised by this outcome, as you probably are.